The Digital Learning Foundation inspires and motivates young people and educators through the use of digital tools, innovative technologies and encouraging their use in everyday teaching and learning. Already, more than 25,000 young people have experienced one of our 3D shows, workshops, digital media competitions or other activities. Help us, book or sponsor a show now. Our projects also aim to promote the public understanding of science or the arts and encourage students to consider these areas as potential careers. We are researching, developing and evaluating the use of new tools and the results will be made available on this site. All of our shows are designed to support the curriculum. On this site you can find out about our shows, workshops, challenges and other activities, as well as resources and free applications. If you or your school would like more information or to book one of our activities, our contact information is here. We will then contact you to discuss your requirements in more detail. We offer an ever growing list of 3D shows, a number of which have associated workshops and digital media competitions. Each of our shows is presented live, using our own interactive 3D software... they are not films! Clicking on the item title or the "more:" link, will take you to each shows main page. You will find information about the room requirements to host a 3D show here. More than 25,000 students of all ages have taken part in one of our activities. You can also find educational resources by clicking here. An amazing 3D school show, that comes to you! Presenter lead realtime 3D Show, with voting system. Covers Newtonian Gravity, Life of Stars and Formation of the Universe. Maximum of 40 pupils (30 with Gravity Workshop). This is a full day activity for up to 30 students, in teams of 4 or 5. Includes the 3D Gravity show. Presenter lead realtime 3D Show. A new 3D school show being developed in conjunction with Dr Pete Edwards, Durham University. Will explain the science happening at the LHC, in a way that is suitable for S2 - S4. BTBA & What does it mean to be Human? This new 3D show takes audience involvement even further, by using voting pads to make decisions that determine what happens next. BTBA is a Biomedical show that explains how the body works by using both real medical 3D data and simplified 3D models. The show raises a number of ethical issues that are then discussed in the follow on debate and presentations can be submitted for the digital media competition. Target P7 - S1. More details soon. We have 30 free days to allocate on a first come basis! If you are interested in BTBA, and are a school located in Scotland, then please contact us as soon as possible! Space II : Is there Anybody Out There? Presenter lead realtime 3D Show, with voting system to enable audience interaction. Covers Newtonian Gravity, Life of Stars and a Current theory on Formation of the Universe. Gravity, is a travelling school show that is presented using Stereoscopic Projection, to create a memorable immersive 3D experience, that brings the “Wow” factor into the classroom to promote learning and understanding. There are some common misconceptions about gravity and the way it works. This 3D show tackles them through a series of virtual experiments, that explain the basics of Newton’s theory of Gravitation, why satellites orbit the earth, why astronauts float about, and much, much more. We then explore the formation of the universe and the part that Gravity, Dark Matter and Dark Energy have played, using material from the Institute of Computational Cosmology, University of Durham. The Final part of the show looks at the Life and Death of Stars. Including, what will happen to our Sun and what happens when you fall into a black hole. A voting system is used throughout the show to pose questions and capture responses. This show can also be combined with the Gravity Challenge Workshops. Over 5,000 pupils have already enjoyed this show, and over 24,000 have taken part in Digital Learning Foundation activities..
Book now! Only £275 + travel. This includes up to four shows within normal school hours. If you or your school would like more information or to book one of our activities, please don't hesitate to contact us. * No buses... we come to you. Our journey starts with the earth in space: why we experience day and night, the different seasons and view the moon in various phases. From there we travel deeper into our solar system, examine the planets, investigate their relative sizes, temperatures and practice memorising their names. Next we cover some key space missions including the Apollo moon landing, we join the exploration rovers on the surface of Mars and the Cassini mission to Saturn. On the last leg of our expedition we see the stars of the Milky Way as never before, as we fly through the constellations discovering millions of stars, other solar systems and end with an appreciation of the vastness of our galaxy. Space - The Solar System and Beyond, is a 40-45 minute program and usually four shows can be provided in a school day. The number of children per show will be determined by the size of room, which must have good blackout. Most AV rooms will accommodate a minimum of 20 children plus our large 2.4m screen and stereoscopic 3D projection system. Large audiences of up to 60 can be possible where room size permits. However, we recommend that around 30 to 40 pupils, is really best. After school sessions and special events can also be provided, ask for details. This includes up to four shows within normal school hours, additional shows after hours can be added for an additional fee, contact us for information. Details about size of room etc; can be found here. 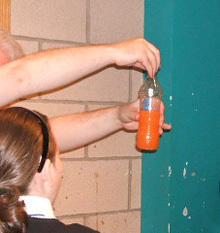 Space - The Solar System and Beyond, was delivered as part of the Careers Scotland Blast Off To Science Space School visits during June 2006, it was part of the Careers Scotland Science and Technology Matters programme and was presented at the 2005 HMIE Conference, Dunblane Hydro as an example of innovation in learning. As part of the James Clerk Maxwell year celebrations, the DLF were commissioned by the James Clerk Maxwell Foundation to produce an inspirational 3D show that introduces the work of Maxwell to both a general audience and S3 and above students. The show focuses on his work on the electromagnetic spectrum and aims to take the participants on the journey of discovery that lead to Maxwell's theory that unified Magnetism, Electricity and Light. Our initial funding was for 30 days of shows in schools anywhere in Scotland. So, to help select those schools we held a digital media competition. The project was funded by the Heritage Lottery Fund and over 5,000 students have seen the show. Music is by PJ Moore. The show uses the same passive stereo 3D technology that has been used to great effect in our "Space- the Solar System and Beyond" Traveling shows. Please contact the Digital Learning Foundation if you are interested in booking this show. 3D : Bring them back ALIVE! This new 3D show takes audience involvement even further, by using voting pads to make decisions that determine what happens next. BTBA is a Biomedical show that explains how the body works by using both real medical 3D data and simplified 3D models. The show raises a number of ethical issues that are then discussed in the follow on debate. Multi-media presentations on the topic "What it means to be HUMAN" are then submitted for a digital media competition. We have 20 free days to allocate on a first come basis! Medical and technology advances will soon challenge the definition of what it means to be human, are we ready to make informed decisions? LHC 3D : It's all down to Gravity! A new 3D school show being developed in conjunction with Dr Pete Edwards, Durham University, that aims to explain the work that is happening at the LHC to find the Higgs Boson amongst other things. Will be suitable for Keystage 3 & 4 (13-16yrs). The following images are from a number of different schools, showing different arrangements of the equipment. As you can see, we are very flexible and as long as the room is dark and large enough we will be able to make it work. A pair of NEC DLP projectors in a stacker and fitted with polarising filters. Apple MacPro with 512MB graphics card. If you have any questions about our requirements please don't hesitate to contact us. What Maxwell did for us! BTBA : The Big Debate! What does it mean to be HUMAN! The follow on challenge for the Bring them back ALIVE! 3D show. David Hanson : Robots that "show emotion". Alan Russell : Regenerating our bodies. The Gravity Workshop usually follows the Gravity 3D show and if all of the challenges are completed, it is a complete day of integrated activities. Number : Maximum 30 students, in up to 6 teams. This 3D show starts with a series of virtual experiments that explain the basics of Newtonian Gravity. We then cover the formation of the universe and the part that Gravity, Dark Matter and Dark Energy played, using material from the Institute of Computational Cosmology at the University of Durham. The Final part of the show looks at the Life and Death of Stars. A voting system is used throughout the show to pose questions and capture responses. Over 5,000 pupils have already enjoyed this show. This workshop is a science based digital media challenge that includes a series of hands-on activities. Working as teams of 4 or 5 students, they start with some simple experiments that help in understanding gravity and motion. 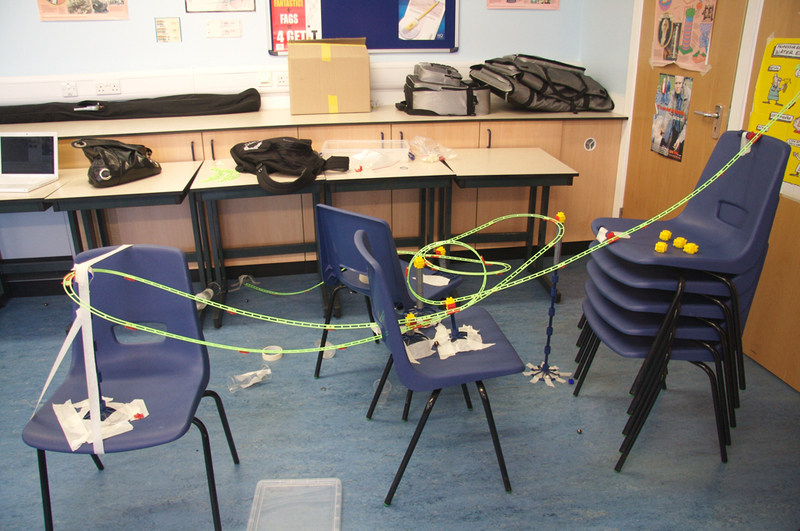 Then, they try an build the fastest roller coaster possible with the kit provided. During these activities, they are using the DV camera as a timing and analysis tool to capture and playback slowly, to help understand what is actually happening. For many of the activities, they are asked to predict what they think will happen, compare this to what actually happened and then interpret their results. In the Movie Challenge, they create movies to explain what they have learned, using the footage they have already captured and new footage, graphics and animations etc; The final movies are then introduced by each of the teams and shown in Final Presentation. Teams are named after scientists, who have made a contribution to our understanding of Gravity and its effects. Teams can also be asked to research their scientist and include this in their movie. This workshop provides a real context for learning and promotes collaborative working, critical thinking, creativity and cross curricular links. It is essential that the teams plan ahead, share tasks, thoughts and ideas and work well together. Supports the Curriculum for Excellence. The 3D show equipment (screen, projectors, etc) does need to remain set up for the duration of the visit. If space allows, then it is possible that some of the workshop activities could also use the show space. Please email us with rough sizes of the room and some photos would be helpful, if you intend to use the same room for everything. It can be useful to have an extra Water Drop. Easily cleaned floor surface, that is ok if it gets splashed with a little water. We provide a 1.5m dia pool to catch the spillage from the dropping bottle. 2m x 2.5m - 3m probably large enough for each station. This is best in a space/room where light levels can be controlled to some degree, ie; have the lights off, and close blinds. This is to allow the DV camera shutter to remain open for the full 1/25 sec. A wall that the meter stick can be taped or bluetacked to, can be helpful. 2m x 2.5m - 3m probably large enough for each station. Privacy, as it is important that other teams can't see how this challenge is solved. There will be balls flying through the air, so should be a space where this will not cause a problem. As large as possible, the balls will travel around 6-8m through the air. The roller coaster challenge is after the experiments and can reuse the same spaces. A stack of 3 or 4 chairs to be used as the roller coaster starting point. As you can see from the gallery, the roller coasters will vary in size and shape, but as a rough guide a space of around 3m x 3m, or longer, would be good for each team. Where possible, the team table should be close to the teams roller coaster space. The space for this is additional. It might be useful for the team, to have researched their scientist before they come. It is useful for us to know in advance what level of iLife, iWorks or movie making experience the class/teams have, ie; None/Some/Experienced. This will allow us to organise "just-in-time" learning sessions if required. The top two teams from each day, will be given additional time, with agreement from the CLC/School, to rework their movie and complete an additional task, to compete for the annual prize against the top teams from all the other events. 1st : £100 in Amazon Vouchers for CLC/School and either an engraved 2Gb iPod Shuffle or £45 in Amazon Vouchers for each team member. 2nd : £50 in Amazon Vouchers for CLC/School and either an engraved 1Gb iPod Shuffle or £30 in Amazon Vouchers for each team member. 3rd : £25 in Amazon Vouchers for CLC/School and £15 in Amazon Vouchers for each team member. There will be a Trophy or Certificates for the Fastest Roller Coaster, Most Inventive/Exciting Roller Coaster, Best Documentary Movie and Best Promotional Materials. We are now trying to raise additional funds to be able to bring the top teams together in a common venue for two days to do the Gravity & Roller Coaster Challenge Grand Final, judge the films and have the prize giving event. If you are interested in taking part, or can help with a venue, funding or prizes, please do contact us. All of the equipment is easily and cheaply obtainable. Do please let us know, if you use this workshop with your class, as we would like to hear how it goes and would be grateful for any suggestions you may have. If you have ideas for other experiments or for modifications or extensions to the existing ones, please add them to the other experiments section or the comments. If you would like to enter your school team for the competition, please contact us to register. You need a DV Camera and a Mac or PC with video editing software and cable to connect them. Not as easy to use as RCT3, but also fewer restrictions. This version of the Gravity Challenge started with four days of theGravity 3D show, and then continued with twelve days of science workshops. The first six were with S1 Ardrossan Academy students and then continued with the cluster primary schools Stanley, Winton, West Kilbride and finally Dykesmain. "Working as teams of 4 or 5 students (P7 or S1), the challenge starts with some simple experiments that help in understanding gravity and motion. The teams also film the experiments, both as an integral part of two of the experiments and to create an explanation of at least one of the experiments (max 2mins). 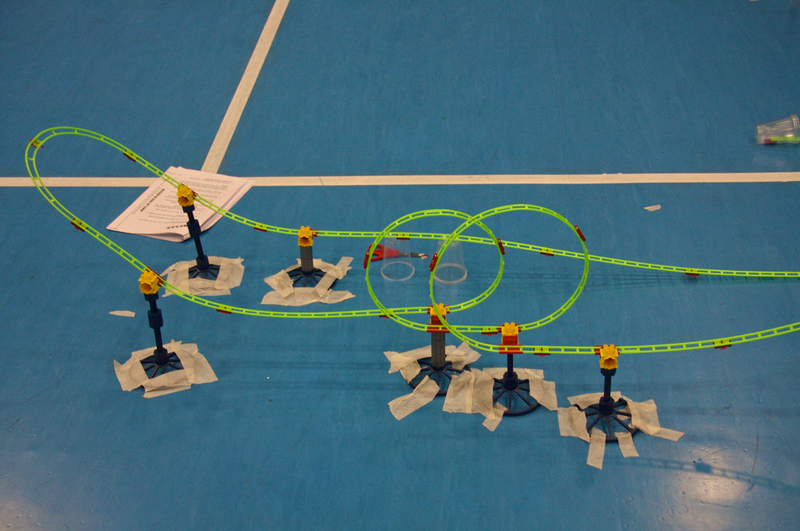 Next, the teams try to build the fastest or most inventive roller coaster possible with the kit provided. They also film this to create a 30sec-1min advert to promote their Roller Coaster. During the day, the teams complete a workbook and are asked to predict what they think will happen, compare this to what actually happened and then interpret their results. They also have to return their roller coaster kits exactly as they were given, and finally they get to see the movies they have created. A really intense day of fun activities"
To assist pupils, who may not have had any previous iMovie or Garageband experience, there are 5 min introductions to each, given at the start of the movie challenge. The teams are marked on teamwork, workbook, RC Kit, Fastest RC, Most Inventive RC and their movies. Funding for this series of events came from North Ayrshire Education Dept. 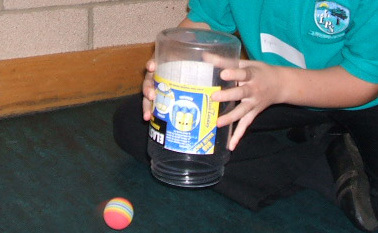 The Gravity Challenge was originally developed with funding from STFC. Includes images of students, so movie can't be shown on this public site. 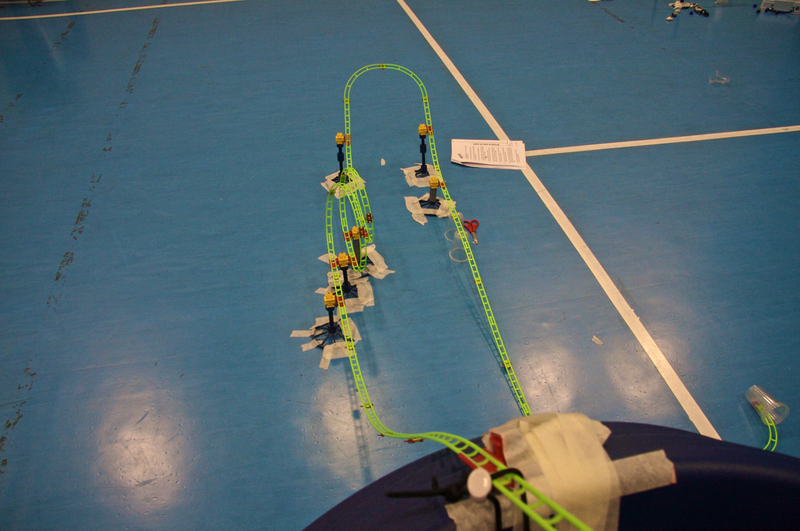 We have been asked to provide information on both the roller coaster kits and the video cameras that we used for this event, both by teachers and pupils. 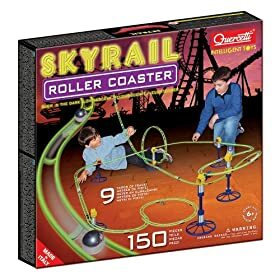 SkyRail Roller Coaster (Quercetti) model 6430 with 150 pieces. Can usually be purchased from Amazon for around £16 - £20. We bought extra kits so we could add some additional pieces and so we would have spares. The track can be broken if treated roughly, however our kits have been used for 32 days of events and we have only needed to use the track from two spare kits for replacements. 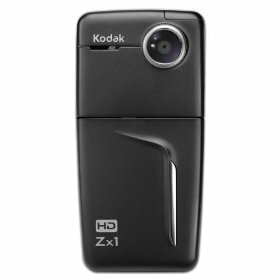 Kodak Zx1 High Definition Video Camera. Great camera for schools, simple to use, robust and no film to worry about. When shooting video it can be used in VGA, HD and HD60 modes. If using iMovie 06 (iMovie HD) it is best to use the VGA mode to avoid long waits when importing. Can also take reasonable still photos. Comes with everything apart from a SD card. However, make sure you buy a fast SD card like the SanDisk Ultra II or better, or you can have audio sync problems. 4GB is a good size and reasonably priced at around £6 - £8. We also found that some of the schools MacBooks wouldn't mount the camera with the USB cable supplied, but worked fine with a USB card reader. Everything can be purchased from Amazon. Galileo 30 Jan 2009 - First Place winners in the best team category. This intense day long science workshop started with the Gravity 3D show, then continued with a series of hands-on activities and a digital media challenge. More information can be found here. "Working as teams of 4 or 5 students (year 9 or 10), the challenge starts with some simple experiments that help in understanding gravity and motion. 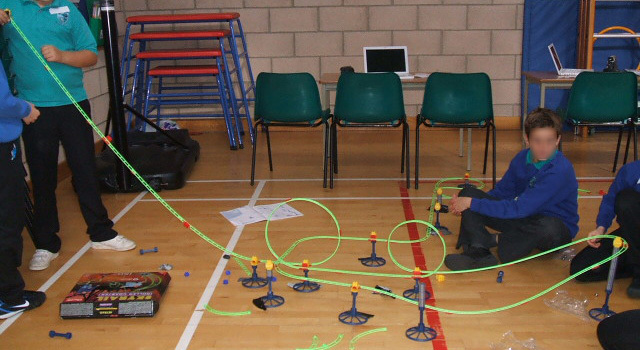 Then, the teams try to build the fastest or most inventive roller coaster possible with the kit provided. The teams also film the activities, both as an integral part of two of the experiments and for the Movie challenge, where they are asked to create either an explanation of at least one of the experiments (max 2mins) or to create an advert (30sec-1min). During the day, the teams complete a workbook and are asked to predict what they think will happen, compare this to what actually happened and then interpret their results." The teams are marked on teamwork, workbook, RC Kit, Fastest RC, Most Inventive RC and their movie. More images from the tour can be found here. A pdf file of our evaluation report to the STFC for this project can be found here. 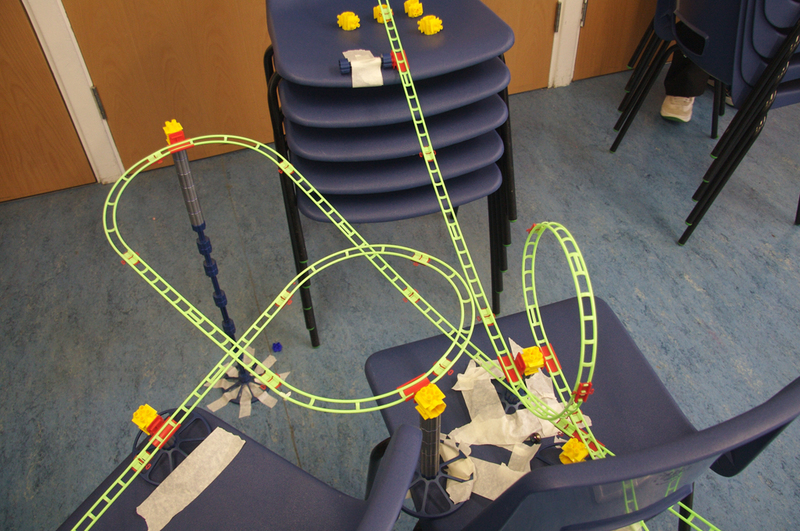 We have been asked to provide information on both the roller coaster kits and the video cameras that we used for our recent events, both by teachers and pupils. Comes with everything apart from a SD card. However, make sure you buy a fast SD card like the SanDisk Ultra II or better, or you can have audio sync problems. 4GB is a good size and reasonably priced at around £6 - £9. We also found that some of the schools MacBooks wouldn't mount the camera with USB cable supplied but worked fine with a USB card reader. James Clerk Maxwell was born in Edinburgh 175 years ago, and was one of the greatest scientists who have ever lived. To him we owe the most significant discovery of our age - the theory of electromagnetism. He is rightly acclaimed as the father of modern physics and also made fundamental contributions to mathematics, astronomy and engineering. Although not as widely known by the public as Newton or Einstein, his discoveries have helped shape the modern world. If you are interested in taking part in the next Maxwell challenge please contact the Digital Learning Foundation. The challenge to be carried out by groups of four or five S1/S2students. They should take the theme - "What James Clerk Maxwell has done for us!" and create a promotional presentation that could be used to increase awareness of the impact that Maxwell has had on our modern world. This could take the form of an essay, a poster, a slideshow, an animation, a cartoon strip, a song, a movie, a podcast.. as long as it is in a shareable digital format - the more inventive and appropriate the better! A record of the research, decision and design process that is gone through should be submitted - a list of sources, mind maps, story boards, or whatever was used to arrive at their solution. A concept statement is also required. Group photos with permission for use should be supplied if possible. The entire project should be completed in two or three days and must be students own work. Three entries can be made per school and it is up to each school to decide how they select their entries..
1st Prize :School: A day of Maxwell's Rainbow 3D Shows, £100 Amazon Vouchers + DLF Membership. Each team member will also receive an iPod Shuffle and a £25 Amazon Voucher. 2nd Prize : School: Maxwell's Rainbow 3D Show, £50 Amazon Vouchers + DLF Membership. Each team member will also receive an iPod Shuffle and a £20 Amazon Voucher. 3rd Prize : School: Maxwell's Rainbow 3D Show, £25 Amazon Vouchers + DLF Membership. Each team member will also receive a £15 Amazon Voucher. A further 17 Scottish schools, who take part, will also be offered a free day of Maxwell's Rainbow 3D Shows in their school. "Maxwell's Rainbow 3D Traveling Show"
As part of the James Clerk Maxwell year celebrations, we have been commissioned by the James Clerk Maxwell Foundation to produce an inspirational 3D show that introduces the work of Maxwell to both a general audience and S1/S2 students. The show focuses on his work on the electromagnetic spectrum and aims to take the participants on the journey of discovery that lead to Maxwell's theory that unified Magnetism, Electricity and Light. The project is funded by the Heritage Lottery Fund and 30 events will be held all over Scotland, this competition is to select the 20 Scottish schools that will receive a free day of "Maxwell's Rainbow" 3D shows at their school. Being piloted in November, shows will be available from Dec. Music is by PJ Moore. The show uses the same passive stereo 3D technology that has been used to great effect in our "Space- the Solar System and Beyond" Traveling shows. In addition, the top three schools chosen by the judges, will also receive a sum of Amazon Vouchers and a years free membership of the Digital Learning Foundation. Schools outwith Scotland are welcome to take part, but should they win a prize, the 3D show may be substituted by an alternative prize at the discretion of the judges, whose decision is final. Each member of the top three teams will also win individual prizes as listed above. 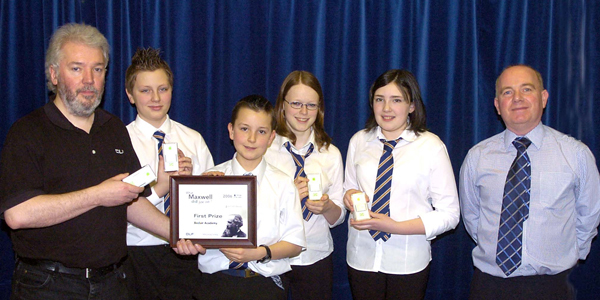 We would like to thank the James Clerk Maxwell Foundation, The Heritage Lottery Fund, Careers Scotland and P.J. Moore for their help and support for this project. Below are the winning entries. 1st Prize : Boclair Academy, Bearsden, Glasgow. 3rd Prize : Lockerbie Academy, Dumfries & Galloway. 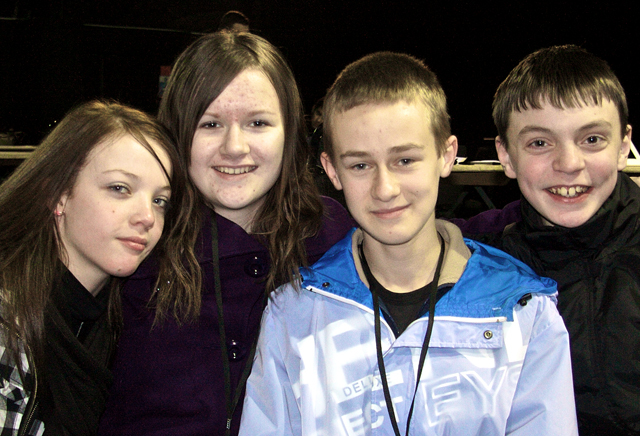 The team from Lockerbie Academy submitted a website. The team from Smithycroft submitted a PowerPoint presentation. In June 2004, in conjunction with Careers Scotland, we ran the FilmSchool2004 enterprise challenge for Scottish secondary schools. 120 S5/6 students from all over Scotland took part in the 3 day event. To produce a 2 minute video that promotes their local area as a great place to live and work. A second challenge to produce a 30 second trailer was also given at 6pm on the night before the final deadline. Although the final product was important, the teams were marked on the process. Each had to submit a concept statement, storyboard and script. They were also marked on how they worked as a team and how well they had fulfilled their concept. Judges were from the BBC, NASA and Scottish Screen. Developed and run for Careers Scotland. Supported by Apple, Canon and Scotsys. In the add comment section below : please leave a link to your blog and the description you would like used. We will add it to this list. This site exists to help educational bloggers across Scotland to find each other and to talk to each other. Hi there. I have been involved in education for a long time now. I started teaching Physics then moved to Computing as computers came into schools. I taught in a number of schools in Inverclyde for nearly twenty years. I am now an education adviser (Quality Improvement Officer in any other place!) with Renfrewshire Council. This blog in no way endorses or comments on anything to do with Renfrewshire and any comments made here are non attributable. You can see from my interests that I have far too many interests and not nearly enough time to do anything about them! A school or class blog is a great way to keep your local and the wider community up to date with what you and your students are doing. iMovie, iPhoto, GarageBand - support and more..
Educational Use: All files are free of charge to UK schools, RBCs and LEAs through the national education broadband networks and are strictly for internal non-commercial use only. No other third party publishing or re-use is permitted without a commercial licence. If you wish to buy clips you will have to log on from a PC which is not part of a school network. In 2005, First Light Movies, the UK Film Council's filmmaking initiative for five to 18 year olds, delivered a project in 2005 called Big Screen Science, which used filmmaking to engage secondary school students in biomedical science issues. Now there’s a free teaching resource pack to support the project which, as well as the DVD of the six films made, includes key science, class activities and suggested discussion issues. coming soon - here at the DLF! Scratch is designed to help young people (ages 8 and up) develop 21st century learning skills. As they create Scratch projects, young people learn important mathematical and computational ideas, while also gaining a deeper understanding of the process of design. Scratch is available free of charge, go to Download. To find more about the ideas underlying Scratch, visit the page for Educators. Gamestar Mechanic was developed through a unique collaboration between Gamelab and the Games and Professional Practice Simulations (GAPPS) group at the University of Wisconsin-Madison. Funded as part of the MacArthur Foundation’s Digital Media and Learning Initiative the project supports many 21st century skills and aims to give young people a platform to express their ideas through the making and sharing of games. Trying to understand Protein Folding? Then this game might just be for you. Foldit is a revolutionary new computer game enabling you to contribute to important scientific research. An online community created to support amateur and professional game creators to connect, gather resources, exchange ideas, post their portfolio, play member created games and connect games to social networking platforms. An intuitive development platform that democratizes game design by enabling non-programmers to create original, sophisticated games. Through a user-friendly interface, game designers can access complex algorithms necessary for implementing professional-level artificial intelligence and game play, without programming knowledge. Free download and demo, but save disabled. $29.95 for full version. Use the comments link at the bottom of this page to suggest more links. Will be moderated. Thank you. Einstein placed on record his view that Maxwell's work resulted in the most profound change in the conception of reality in physics since the time of Newton. Maxwell's researches united electricity and magnetism into the concept of the electro-magnetic field. He died relatively young, and indeed some of the theories he advanced in physics were only conclusively proved long after his death. For example, he did not live to see proved in the laboratory his theory that when a charged particle is accelerated, the radiation produced has the same velocity as that of light: it is a unification that remains one of the greatest landmarks in the whole of science. It paved the way for Einstein's special theory of relativity. Maxwell's ideas also ushered in the other major innovation of twentieth-century physics, the quantum theory. "All the mathematical sciences are founded on relations between physical laws and laws of numbers, so that the aim of exact science is to reduce the problems of nature to the determination of quantities by operations with numbers." "most profound and the most fruitful that physics has experienced since the time of Newton." "This velocity is so nearly that of light, that it seems we have strong reason to conclude that light itself (including radiant heat, and other radiations if any) is an electromagnetic disturbance in the form of waves propagated through the electromagnetic field according to electromagnetic laws." Use the comments box at the bottom of this page to suggest more links. Will be moderated. Thank you. Music makes such a difference to students movies and presentations, but it needs to be from a legal source. This probably means you have two options, the students create the music themselves with GarageBand ( or similar) or you source royalty free music. This is music released under a Creative Commons license and there may be rights reserved, so it is essential that you check for each piece. Many artists only ask that you must release the finished work with the same license and that they are credited. Stereoscopic head mounted display : prototype! Are we there yet how long will it take to travel to the moon, other planets, nearest star etc..
Use the add comment link at the bottom of this page to suggest more links. Will be moderated. Thank you. If you need another reason why the iPod Touch should have a camera, then Oscar Stringer has just given you one with the launch of his photographic storyboarding tool - iStoryboards. Getting students to understand the importance of planning their movie /animation is one thing. Getting them to create a useful storyboard is another. This application not only makes the process easy, but, by having a slideshow mode that allows you to add music, the storyboard becomes a production in itself. Great work Oscar. Oscar is an Apple Distinguished Educator. There are lots of hosting services, but finding one where it doesn't either link to the hosting site (like youtube.com where there can be inappropriate content) or include adverts, can be difficult. We now use ScreenCast, as it offers a good free service, that can be upgraded to give more bandwidth and storage fairly inexpensively. It also has a desktop application that enables large files to be uploaded. No adverts, but will link back to hosting channel. Only content that you have been involved in the creation of, can be uploaded. Free Online #094489">StorageAccess important files from any computerShare photos, and files too big for emailSynchronize and backup foldersSub-accounts and RSS feeds for groups1GB for free. The basic free service may be limited, so check out number of questions and number of responses allowed, but it can still be a very useful way of getting feedback. Watchout for adverts being added to your survey. Still offers free wikis, but there are limits to size and use. "Looking for a text editor that is designed by people actually caring about Human Interface Guidelines? A nice way to edit your HTML files? Or a way to work together on code, texts or notes? Be sure to check out SubEthaEdit. While originally designed for coding together, its collaboration features have also proven to be quite useful for teaching, note-taking (e.g. at conferences) and co-writing text. Imagine meetings with collaborative minute taking or writing your TV/film script or book together with your co-authors." "The world's most innovative collaboration tool, that lets users work, talk, and think together. With iStorm, a user can open up a document, and immediately start brainstorming it with other collaborators over a network. " "Like iStorm, iChalk incorporates useful features such as a simple chatting system, and innovative tracing feature. iChalk also allows users to export the chalkboard images as JPEG file and even into a Quicktime movie file." File2.ws is a free website that converts any of your own files into a public online web page. Every converted file to a web page has a unique web address so you can share it with friends, or other people on the internet. This allows information to be shared quickly and efficiently to a large audience. Create delicious slideshows and share them with hungry viewers. Wallwisher is an Internet application that allows people to express their thoughts on a common topic easily. A wall is basically the 'web page' where people actually post messages. What can I do with Wallwisher? Anything that might need input from a lot of people. A poll maker for your blog, classroom or friends.. Capture videos of onscreen action in one click. ?Record screencasts, tutorials, demos, training, lectures and more. Share and stream videos online in Flash. ?Embed them on blogs and webpages or send them by email. Allows you and your class to add annotations to any website.... and see what others have written. A map creating and sharing tool. "Communicate with anyone, anywhere in up to 45 languages. BabelWith.me is a simple, free group chat that automatically translates your conversation as you type." "Use NotePub, instead of paper, to save, share, and search your notes. Quickly take notes including images, files, links, and tags. Search your online notepad using tags and keywords. Make your notes public, private, or share with a group. Encrypt private data. Control who gets to see what..."
"Posterous lets you post things online fast using email. You email us at post [at] posterous [dot] com and we reply instantly with your new posterous blog. If you can use email, you can have your own website to share thoughts and media with friends, family and the world." CompuMentor's downloadable guide to using blogs, tags, and RSS to broaden your reach. Michael K. Bergman's comprehensive guide to professional blogging. Nonprofit Online News' introduction to nonprofit blogging. A guide to creating successful content from To-Done! How to Save the World's tips for making your blog truly informative — hence valuable — to your readers. How to Save the World's guide to making blogs a real medium for communication. Pro Blogger's introduction to the basics of blogging. NetSquared offers ideas for your organization's blog. Get started with free blogging tools..
...and how is it different from a blog? PBworksi has proved to be invaluable to us. The new v2 interface is much easier and more powerful and the recent 200x increase in size for both free and premium wiki's will be a huge benefit to schools and charities like us. And the best thing ... no Google Ads, so no surprises that inappropriate content or products are being advertised on your site. However, the new price structure for premium wiki's is no longer as attractive as it has a number of usage restrictions. Over the last twelve years that I have been involved with multimedia and visualisation for education and science communication there has been a dramatic change in the technology available to, and embraced by, school age students. Mobile phones are probably the most obvious, and the rapid rise of texting and instant messaging has been predominately driven by this group. Digital still and movie cameras with easy to use editing software, digital music creation and most recently pod casting, have blurred the boundaries between being a consumer of digital media and a creator of it. The Digital Learning Foundation was founded to help educators and students take advantage of the opportunities offered by these digital tools and our FilmSchool project is an example of this. However, over this period, there have been equally dramatic changes in the more esoteric world of large scale, realtime interactive stereoscopic computer visualisation. Once the preserve of a few programmers world wide, this technology is about to explode onto the market place for entertainment, business and research....and again, it is gaming and the availability of low cost auto-stereoscopic displays that will drive this. Therefore, in four or five years stereoscopic displays are likely to be common in the home and once you have experienced a good stereoscopic display.... well, it only needs to be seen to be believed. So what is Stereoscopic Visualisation? It is the way your brain expects to see things, with a left eye view and a right eye view, and from the minor differences that around 60mm of eye separation creates in these two views, the brain is able to calculate depth and therefore able to construct and understand the real world we experience every day. It is the difference between looking at a flat photograph or illustration of an object and feeling that you can reach out and touch the object itself. Realtime Interactive Stereoscopic Visualisation combines modern stereoscopic display technologies with a powerful computer that can handle huge amounts of data and allow it to be manipulated interactively in realtime. Until very recently the prohibitive costs and complexity of large scale, real time, interactive stereoscopic visualisation limited its use to multi-national companies like BP, Shell, BMW, Mercedes, Nokia or to some very fortunate University Computing Science or Research labs.... But times have now changed, an Apple G5 based system can not only compete, but blow away, those big systems of only last year. And with a complete system costing only a little more than a whiteboard installation it is now possible for schools to gain the very real benefits that stereo visualisation brings. Inspired by the above New York WindowFarms project, the aim is to develop an integrated topic that is suitable for both primary and secondary students. As the pilot project progresses we will include examples of the students work. Stage 1 : Discussion with students. What do plants need & where do they grow? Stage 2 : Experiments : testing growing mediums, nutrients & lighting requirements. Included in the above students will make contact with experts to ask questions, get advice and explore beyond the limitations of the classroom. It is intended that Glow will be used as part of this engagement process. Digital Story Telling : Day 1: Taking Photos, Making Movies! Choosing your growing medium : Experiments to do before..
You should download both of the above, as original gives information not included on the new one. Farms don't need to be flat..
Plants will grow nearly anywhere there are the correct conditions. They grow on hills, mountains, under the sea, and they will grow on buildings, if we give them what they need..
Realtime Interactive Stereoscopic Visualisation combines modern stereoscopic display technologies with a powerful computer that can handle huge amounts of data and allow it to be manipulated interactively in realtime. Until very recently the prohibitive costs and complexity of large scale, real time, interactive stereoscopic visualisation limited its use to multi-national companies like BP, Shell, BMW, Mercedes, Nokia or to some very fortunate University Computing Science or Research labs.... But times have now changed, a standard consumer computer based system can not only compete, but blow away, those big systems of only last year. And with a complete system costing only a little more than a whiteboard installation it is now possible for schools to gain the very real benefits that stereo visualisation brings. Funding Status: Approved. Development started.